YOU ARE LOOKING AT A2005-06 BEE HIVE BLUE. CARD NUMBER IS #14. To CANADA. 2005-06 UPPER DECK. POWER PLAY HOCKEY. "Impact Photos". 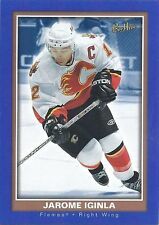 2005-06 UPPER DECK "ULTIMATE COLLECTION". "ULTIMATE JERSEY". 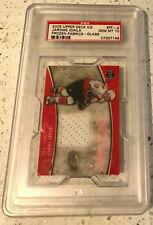 Overseas=..
2005-06 UD SPGU JAROME IGINLA/MARTIN ST. LOUIS 21/25 DUAL AUTO JERSEY #21/25! The card number is RO4. To CANADA. No exceptions! Nor will I mark the item as a gift. Communication is very important! Card is in pretty nice shape. No major defects! Anything less than the price I'm asking will not be accepted! Other Stuff. The card number is GC4. To CANADA. The card number is #FF-JI. To CANADA. NON GRADED CARDS. P.E.I. 14%. NOVA SCOTIA 15%. NO CREASE CLEAN BACK. NEWFOUNDLAND 13%. NON GRADED CARDS. P.E.I. 14%. NOVA SCOTIA 15%. 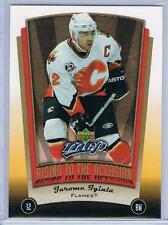 2006-07 UD ARTIFACTS JAROME IGINLA FROZEN ARTIFACTS PATCH GOLD #FAJI 5/10 2CLR! The complete team set includes A Salute to Captain (CPT), Team Logos (TL), Northern Stars (NS), rookie cards (RC) and Team Checklist (TC) cards when applicable. The 24 cards in this team set include. THIS OPTION IS FOR A SINGLE CARD ONLY! I AM TOTALLY HONEST! NO WORRIES ABOUT THAT! THE MORE YOU BUY THE BETTER YOUR DEAL GETS! ANY MAJOR DEFECTS WILL BE LISTED!